Blanche Selva (1884-1942) was one of the most revered French pianists of her generation, though her interests were catholic. She made pitifully few recordings and even those were compressed into a two-year period between 1929-30 when she finally agreed to enter the recording studios. Even then it was, often as not, with the Catalan violinist Joan Massia – she herself had Catalan roots and had met him in 1924. Trained at the Schola Cantorum, Selva was appointed by d’Indy as teacher at the early age of eighteen. In all she taught there for twenty years and was adventurous enough to add her own twist to the usual continental drift westwards of Czech musicians – Selva herself moving to Prague to teach (at around the time Martinů and so many others were off to Paris) and encountering Suk and Novák along the way. She was a front-rank exponent of Albeniz, d’Indy himself, Roussel and many others. She gave the complete Bach keyboard works as a cycle (beginning in Paris in 1904 and a number of times after) as she subsequently gave the complete "32" of Beethoven on several occasions. Shortly after her last recording sessions in Madrid she suffered a crippling stroke and never played on the recital stage again. Forced to leave Spain by the Civil War she died in obscurity and near-destitution back in France in 1942. Her Bach Partita is a precious souvenir of her playing. The Prelude is limpidity itself and the clarity and pointing of the stylish and apt Allemande truly impressive. Her chordal weighting in the Courante and her rather cool undemonstrative musicality all point to a major Bach player of the most august French school. The dynamics of the concluding Fugue are splendidly controlled and her throwaway ending insouciant in the extreme. If anything, the Franck is even better and stands alongside the almost contemporaneous Cortot recording as twin poles of French School Franck interpretation. She plays the Prelude with exceptional understanding of line and depth of weight, a tremendous sense of clarity and a control that never precludes metrical freedom. The rolled chords of the Choral disclose a movement that is short neither on detail nor on affection; nothing however is unduly romanticised and everything is subordinated to acid architectural considerations. Hers is a deeply serious and affecting musicality. The purposeful warmth of the Fugue is not compromised by unnecessary lingering; reminiscences of the second movement are all the more moving for their sheer unvarnished candour. Wonderful playing. She was long a proponent of the music of the Languedoc-Provencal composer Déodat de Séverac and even wrote a biography of him. She revels in his fresh air impressionism – how elliptically she points the end of Baigneuses au soleil and how charmingly she vests Vers le mas en fête with such drama and such colour. To the mild exoticisms of Les muletiers devant le Christ de Llivia can be added Selva’s own virtuosity and flair for colouristic potential – and she somehow ties the work to its Franckian antecedents with the simplest of inflexions. She also plays the Sardana movement from the sonata in C minor by Juli Garetta, another composer for whom she did much. She joins with Massia for the Bach movement from the third Violin Sonata. He has a rather thin tone, unwarmed by much vibrato, and his shifts sound surprisingly awkward. His trill is also inclined to be a bit rough and his whole musicality is profoundly old fashioned in the context of the day. In the Spring Sonata one’s initial impressions of Massia are reinforced. He is inclined to be heavy going in the opening Allegro, slow and with unvaried and limited vibrato, prominent portamenti. Selva is somewhat occluded in the balance but we can still hear and admire her animated rhythm and her subtle bass pointing. The slow movement is reasonable but some of the jokey rhythms of the Scherzo are rather smoothed over and the finale is short on humour and elation – its soft grained nature co-exists with fine co-ordination between the two and Massia does essay some lightly textured bowing that is interesting to hear. In the Franck Sonata Massia’s singing but essentially limited tone, the on/off vibrato, his occasionally laboured lower (gut, I think, not metal) strings are all very much of their time and place. Selva is the motor for this performance and the recording bears out her strictures that players linger too much in this work; she keeps things on a tight leash. Selva was a powerful, squat woman and Massia a tall elegant slim man and they play like they look. On this showing however Massia was no rival to the much more forward-looking tonalist and compatriot Manuel Quiroga – whose glinting, glittering morceaux discs rather put the antiquated Massia in the shade. This is a fine twofer. It has good notes and is well illustrated. The transfers are the best we have yet had of Selva’s 78s. Malibran CDRG 177 transferred a disc’s worth of these performances quite well, but the disastrous RCP 076 which included the Franck Violin Sonata – woeful transfers – should at all costs be avoided. One thing that Solstice does is to preserve surface noise between movements which is something I happen to like but which hardly anyone else ever does. 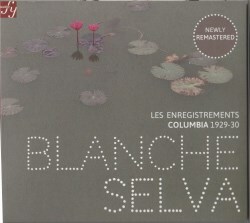 St Laurent Studio has so far released two single discs of Selva’s discs, rather profligately. It would have been easy to have issued them all on 2 CDs rather than spinning out the exercise. In my experience though their transfers are good. For all my strictures Massia is an engaging and by no means unimportant figure in Catalan music making. Selva’s small body of recordings is conspicuously important and this is a fine tribute to her art.